Jypyä Pop (Turku, Finland) on 19 March 2019 in Cityscape & Urban and Portfolio. Very nice scenery. I like this boats in the background. A ver good photo from the situation. Lots of ducks. What is that red barge/ferry thing on which the people are standing? 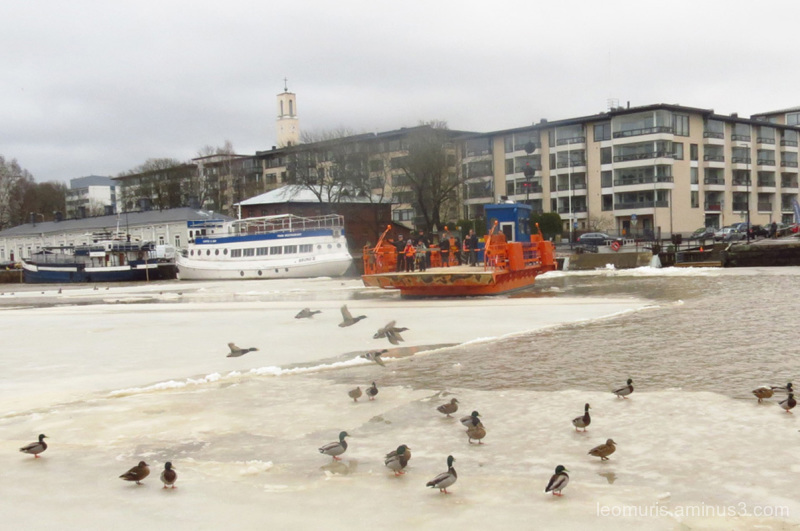 @beach: It is Turku river ferry, that is, "Fori". It transports people across the river from morning to night. The closest bridge is almost a kilometer away, which is why it is helpful for those who are moving here. The name FÖRI comes from the Swedish word "färjan". The mallards are starting to congregate in the hopes that the ice will soon disappear. Great find and capture! The orange an blue barge adds a nice punch of color. Lovely image, but it still seems quite cold. Beautiful image here..yes..spring is here ! Interesting about the ferry and the ice. Winder still has not let go. @B. Thomas: Ice cubes were moving on Monday. Now there is nothing to disturb the movement of the ferry. Oui mais encore du froid..... Magnifique composition. Lots of open water for the ducks. Hopefully, the ice passed quickly so the ferry could proceed. @Steve Rice: The ice passed quite fast, and the new ones were not close. Everything was ok again.